1 In a large, heavy-based pan, stir together the sugar, vinegar, spices and lemon zest and slowly bring to the boil. 2 Add the pears and simmer for 10 minutes, then add the rosemary sprigs and cook for a further 5 minutes, until the fruits are just tender. 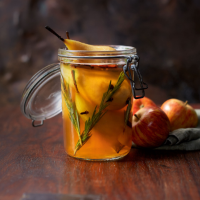 Using a slotted spoon, transfer the pears, rosemary and spices to a sterilised jar (see tip below). Return the pickling liquid to the heat and bubble away for 5 minutes, uncovered. 3 Pour over the pears then seal the jar. When cold, store for up to 2 months in a cool, dark place. Once opened, refrigerate and eat within 2 weeks. To sterilise a jar, wash in warm soapy water and rinse well. Place the jar and lid into the oven at 150°C, gas mark 2 for 10 minutes until dry. If using a Kilner jar with rubber seal, boil it instead as the dry heat of the oven will damage it. This recipe was first published in Tue Aug 25 10:43:00 BST 2015.